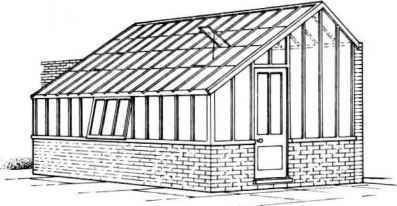 It would be a very demanding gardener indeed who would not be able to find a greenhouse completely to his liking from Ihe wide range that are now available. Between the cheapest and the most expensive models there is almost an embarrassing richness of choice. 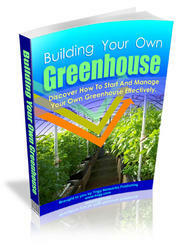 I have something to say on this matter of choice on p. 14, but before considering this important decision (for even the smallest, most modestly equipped greenhouse will mean quite a bit of expense) it is necessary to discuss the different types of greenhouse that are on ihe market and the purposes for which these are most suited. IT»e Span-roof Greenhouse. The even-sided, free-standing, span-roof greenhouse is perhaps the most popular type for it allows the widest possible range of plants to be grown under the best possible conditions. 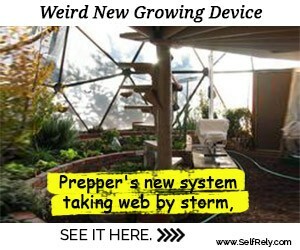 There are several variations on the theme but span-roof greenhouses with glass to ground level are, generally speaking. the most suitable for the average gardener. Such structures are ideal for edible crops such as lettuces and tomatoes and for decorative plants like chrysanthemums and carnations which can be grown in beds on the floor of the house. Span-roof greenhouses of this kind are also just as satisfactory for growing pot-grown plants on an ash or gravel base. The great advantage of this type of house is that the plants gel the maximum amount oflight. It must be said, however, that the plants are less easily attended to when grown at floor level rather than on staging. Also, the heat loss from a completely glass greenhouse is greater than when the sides of the house consist of a low brick or wooden wall. If the intention is to grow plants on staging, then the span-roof house with low walls such as I have just described is more suitable. This type is the standard span-roof house with a door at one end and staging on both sides at the height where the walls end and the glass begins. A useful compromise between the two types already referred to is the design which allows for glass to ground level on one side, so allowing plants to be grown in beds, and a low wall and staging on ihe other side which allows plants to be grown in pots. The Dutch-light Greenhouse. This type of greenhouse is less cosily to boy than others as it consists basically of standard Dutch-light panels which are fixed together to make a greenhouse. Such a structure is notable for the amount of light which is able to reach the plants through the large areas' of unobstructed glass. Dutch-light greenhouses arc ideal for those gardeners whose primary interest is growing tomatoes during ihe summer, chrysanthemums for late autumn and early winter blooms, and lettuces for early spring. This type of house is used extensively by commerical growers and in this case what is good for them is good also for the amateur gardener - but. of course, on a much smaller scale. The present-day Dutch-light house is much more draught-proof ihan its predecessors of even a few years ago. the lights fitting closely together to exclude cold winds, and the roofs are constructed in such a way as to prevent rain drip, which as every gardener knows can be as much resented hy plants as draughts. Dulch-lights are made of softwood or Canadian Red Cedar, I would certainly recommend buying the latter, although they are slightly more expensive, for they last much longer and need very little attention. The Lean-to Greenhouse. The lean-to type of greenhouse makes use of an existing wall, thus forming one side of the structure and cutting down on the cost of materials. As the wall will usually be a house wall there is likely to be some transfer of heat in winter which is another bonus. In many cases the wall will retain heat much longer than glass and the greenhouse itself will be less exposed to the elements than a free-standing structure. attractive show when they are trained against a wall. Like the span-roof greenhouse, (he lean-to type can have glass to the ground or have a low wall or boarded base to the height of the staging. The Three-quart« Span (.reenhoose. 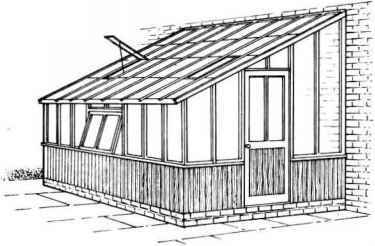 This type of greenhouse, a mixture of the span-roof and the lean-to designs, is not often seen nowadays although it has many advantages. 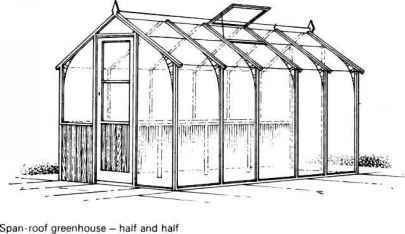 Greenhouses of this type are built against a Wall like the lean-to greenhouse but in this case the house is higher than the wall with a short spun between the eaves and the wall which lets in much light. Extra ventilation can be provided by fitting ventilators in this short span to the very considerable advantage of the plants. In some houses, indeed, the entire length of the span may be hinged to provide air as required. The Circular Greenhouse. A newcomer to the gardening scene is the circular greenhouse. This provides more space for plants in a given overall area than other types of greenhouse. In smaller gardens where space is at a premium, this can be a particularly important factor. The Sun Lounge or Conservatory. The modem sun lounge (an updated conservatory!. preferably with access to the living room, has a value which is becoming more and more appreciated. Many plants which need only Irost protection can be grown in such a structure and sun heat will provide acceptable sitting-out conditions on many days in winter, especially if there is a ready transfer of heat from the house through an open door or French window. It is quite usual for (he sun lounge lo remain unhealed except in the coldest weather, when a small heater can be used to keep the temperature above freezing point. Greenhouse Doors, Hinged or Sliding? Many of the modem greenhouses have sliding doors rather than hinged ones. These can be a considerable convenience if space is at a premium. A minor irritation with sliding doors, however, is that the base runners are liable to have their passage impeded by grit. All doors should be wide enough to allow easy access for a wheelbarrow as there are many occasions when this item of equipment is needed to move such things as compost, plants and flower pots. 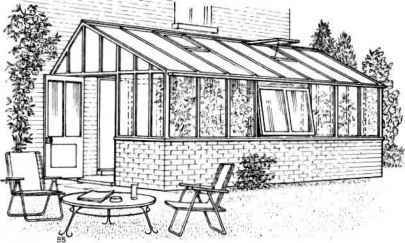 This type of greenhouse, a mixture of the span-roof and the lean-to designs, is not often seen nowadays although it has many advantages. 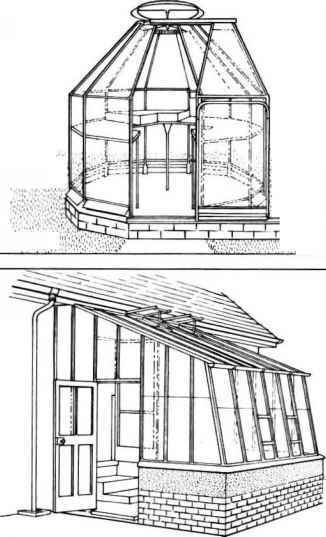 Greenhouses of this type are built against a Wall like the lean-to greenhouse but in this case the house is higher than the wall with a short spun between the eaves and the wall which lets in much light. Extra ventilation can be provided by fitting ventilators in this short span to the very considerable advantage of the plants. In some houses, indeed, the entire length of the span may be hinged to provide air as required. The Circular Greenhouse. A newcomer to the gardening scene is the circular greenhouse. This provides more space for plants in a given overall area than other types of greenhouse. What to grow in a dutch light greenhouse? 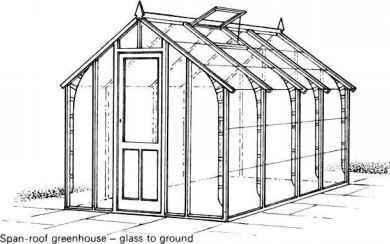 How to build a span roof greenhouse?